Yes, you read it correctly. Time for a group hug! Well, time to get together as musicians anyway…. The summer vacation is coming to an end here now in Australia and very soon the Classical Guitar Society of Victoria will be auditioning for new members of it’s awesome Guitar Orchestra. And yes, it is awesome. And no, not just because I play in it! Hah hah! It fantastic fun and the other guitarists and our fabulous conductor (Ben Dix) are all fabulous people. You’d be crazy not to! And the term “auditioning” is probably a little grander and a little scarier sounding than it really need be. We’re inviting folks to come down and check out our first rehearsal for the season to see what you’re in for (it’s all good, I can promise that too) and then you get to play a piece of two, followed by a bit of sight-reading for our lovely conductor Ben so he can check out your level, your abilities and where you may best fit into the existing group. So, if you can, come on down – we’d love to see you there! 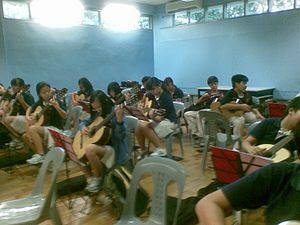 If you can come along – and even if you can’t, as you’re in some other part of the world – there are MASSIVE benefits to playing in a group setting such as a guitar ensemble or orchestra. Yes. Massive. Tis true. Honing your listening skills – being such a solo instrument, we guitarists tend to be quite self-indulgent at times, only having to listen to ourselves. Being part of a group with other guitarists or musicians pretty much forces you to listen to those around you, getting in balance tonally and dynamically, with sense of phrasing and so on. You also get really good at tuning up the guitar very quickly, even learning to tweak tuning a little on the fly! Honing your tonal quality, touch and dynamic range – you thought your piano was soft and your forte was loud? Think again! you learn a whole lot about the dynamic range of your guitar and your ability to create those different variations when you’re in a group setting. And everything becomes magnified (well, kind of but we won’t go into the laws of physics here) by 12, or 15 or 20 or however many others there are in the group. Stretching and seriously improving your sight-reading – when a brand new piece or section gets put in front of you and you need to read it straight off the bat….kinda scary at first, but exhilarating and fun in the end. Especially when you play that really prominent scale run one fret in the wrong position! Hah hah! Fun! – Yes, it’s perfectly fine to make a few mistakes and to have a laugh about them! It’s such great fun to sit and play with other guitarists, and have a bit of a chinwag before and after rehearsal. You never know, you may even make a new buddy or two! Improves your knowledge of the fretboard no end! – That scale run that you got wrong the first time through? You know for sure, each and every time where that starts. That D? S’right there. Easy. Bang. And yes, that of course then translates across into your solo playing. Interacting and learning from other guitarists/ musicians – there will be musicians in the group who know a thing or two that you’d don’t – musically, technically, in approach – and it’s great to learn from your peers. Helping other guitarists and musicians – yes, you may not think it but there are things that you know, you do, or have a certain approach to that your fellow guitarists don’t have in their armoury yet. And this is regardless of what level you’re at. By joining an ensemble you can help spread the love and get others thinking and others playing in different ways, ways they’d not thought about. How cool is that? And if you’ve never played in a group setting before, it gets you a little bit out of your comfort zone and can help with issues of performance anxiety by playing in front of and with others. So what’s stopping you?! Get in there! That would be interesting if you could upload some videos of your performances or/and others playing in the group or even solo.